The interaction of the probe with the tissue characteristic being estimated must be isotropic; no orientation in three dimensions can be favored. This is especially important to consider when estimating length of strings or surface of regions, or when estimating surface or volume of particles. If the strings, surface, or particles are themselves isotropic in three dimensions then no orientation will be favored. There have been reports that endeavor to show that, for instance, the cortical ribbon (Oster, et al., 1993) and various types of neurons in the brain (Schmitz, et al., 1999) are isotropic, and sometimes isotropy is assumed (“In the case of the pulmonary parenchyma it seems acceptable to assume tissue isotropy”, Mühlfeld and Ochs, 2013, Quantitative paramaters of acute lung injury, last paragraph, last sentence and “The air-blood barrier can be assume to be randomly oriented within a cube of lung tissue as it is used for histological preparation”, Weibel and Knight, 1964, p. 370) but object isotropy is rare in many biological systems, and can be hard to prove. Therefore, to ensure isotropy of interaction, some combination of the probe and the tissue preparation must be used to eliminate the chance that any particular orientation of interaction is favored. Technically, the most efficient solution is to choose a probe that is symmetrical in three dimensions and therefore isotropic in three dimensions. This is not available when estimating the surface or volume of particles, but it is possible for length of strings and surface of regions. For length use the spaceballs probe, it is a sphere, and it doesn’t matter how a sphere is oriented when it encounters a string; no particular orientation will result in more or less intersections. For surface use the isotropic fakir probe, it is a triplet of three line segments, all mutually orthogonal to each other; when it encounters a surface, it’s orientation won’t matter since the triplet is symmetrical in three dimensions. Both Spaceballs and Isotropic Fakir do not require the use of isotropic or vertical sections, preferentially oriented sections may be used. Both probes, however, do require the use of thick sections so there is room to fit the sphere or triplet. If you can’t obtain thick sections to estimate string-length or region-surface, or if you are estimating the surface or volume of particles, it is impossible to make the probe isotropic. That means the tissue preparation must be used to ensure isotropy. Isotropic tissue sections can be used. These will be random in three dimensions ensuring isotropy of interaction between the probe and tissue, but they have the disadvantage of usually causing anatomical disorientation; you won’t be able to ‘read’ your tissue as you can when using preferential sectioning. A compromise is to use vertical sections. A vertical direction is picked and the tissue, for instance the tissue block, is randomly rotated around the vertical axis. But the tissue in these vertical sections is not probed with straight line segments or planes. A specially designed line segment or plane is used called a cycloid. Why does a cycloid have to be used when sampling on vertical sections to ensure isotropy? To think about that, lets imagine a test for isotropy. If rays are emanating from a point in two dimensions, we could assure that no particular direction in 2-D space is favored by picking a random angle from one to 360 degrees over and over again. In other words if the point is in the middle of a circle and an infinite amount of rays emanate from the point according to a random angle selection each time, no part of the circle will be more or less likely to be intersected by a ray. The system is isotropic in two dimensions. The problem comes when considering three dimensions. If a point is in the center of a sphere, and probing-rays emanate from that point, we can say the system is isotropic if no part of the spheres surface is more or less likely than any other part to intersect a ray. With a vertical section, the tissue has been randomly rotated in 2-D about the vertical axis, before the sectioning. But once that section is on the microscope, the second angle, the angle that determines how the probing line segments will be arranged on the section, can’t be picked randomly from between one and 360 degrees. Instead the angle must be sine-weighted and to achieve this a cycloid line segment is used. The resulting angles are based on the sine of the angle between the vertical axis and the particular ray. Notice that the intersections are spread out at the poles when compared to the equator to make up for the fact that a given increment in the angle will cover less area at the poles than at the equator. 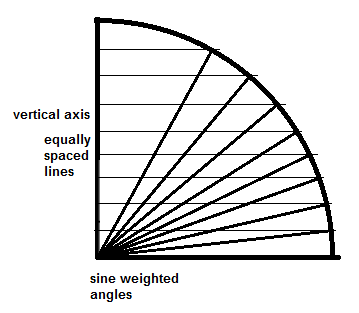 The sine of an angle between 0 and 90 degrees varies from 0 to 1, but not in a linear way, it varies in a sine-weighted way. Instead of generating the sine-weighted angles implicitly, it is easier to correct the situation by using a probe that is sine-weighted, the cycloid. “A cycloid can be thought of as a string of infinitesimally small line segments with sine-weighted orientations relative to a specified axis” (West, M.J., 2012, Chapter 4, Isotropy, Isectors, and Vertical Sections, section 4.6.3, second paragraph, third sentence). A cycloid can be created by tracing a fixed point on a circle as the circle rolls along (West, M.J., 2012, Chapter 4, Isotropy, Isectors, and Vertical Sections, fig. 4.7). In the animation above, the cycloid line-segment probe put down on the tissue is represented between 0 and π. “When the minor axis, Figure 4.7C, of the cycloid is aligned with the vertical axis on a vertical section, the cycloid is a linear probe that will fulfill the criteria for a linear probe that has all orientation in 3D space when placed on vertical sections and will result in the desired isotropic interactions with surface features and particulate objects (West, M.J., 2012, Chapter 4, Isotropy, Isectors, and Vertical Sections, section 4.6.3, second paragraph, last sentence). What probes use vertical sections and cycloids? If you are estimating surface and have to use thin sections and don’t want to use isotropic sections, the cycloids for Sv (Baddeley et al., 1985) probe can be used on vertical sections. In this case the minor axis of the cycloid is parallel to the vertical axis. If you are estimating the surface or volume of particles, all of those probes require isotropic or vertical sections. Let’s take for example the most popular probe for estimating the volume of cells, the nucleator. 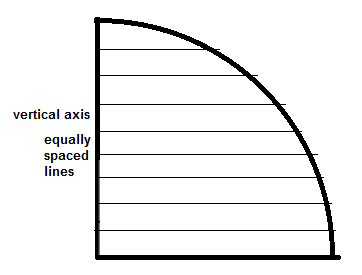 If you don’t want to use isotropic sections, vertical sections can be used, and in this case the minor axis of the cycloid is also lined up with the vertical axis. The sine weighted nature of the cycloid line segment ensures there is an equal chance of probing in any three dimensional direction. If you are estimating length of strings, sine weighted planes can be used to probe on vertical sections (Cycloids for Lv; Gokhale, 1989). 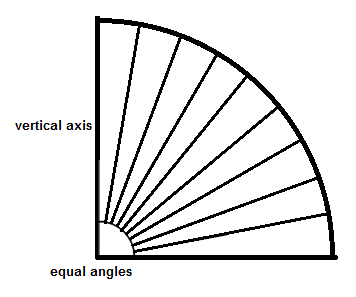 In this case the minor axis of the areal cycloid must be perpendicular to the vertical axis. Since a plane is used for the probe, however, the section must be thick, and in that case, an isotropic probe, Spaceballs (Mouton, et al., 2002) should be used. Baddeley A.J., Gundersen H.J., and L.M. Cruz-Orive (1985) Estimation of Surface Area from Vertical Sections, J Microsc;142:259. Gokhale, A.M. (1989) Unbiased Estimation of Curve Length in 3-D Using Vertical Slices, J. of Microscopy, 159, pp. 133 -141. Oster, S., Christoffersen, P., Gundersen, H. J., Nielsen, J.O., Pakkenberg, B. and C. Pedersen (1993) Cerebral Atrophy in AIDS: a Stereological Study, Acta Neuropathol., 85, pp. 617 -622. Weibel E.R. and B.W. Knight (1964) A Morphometric Study on the Thickness of the Pulmonary Air-Blood Barrier, J. of Cell Biology, 21, pp. 367 -384.